My parents taught me the importance of spending time with our extended family. My parents are gone now, but my husband and I would visit my aunt Jean—my father’s oldest sister, who was also my godmother—twice a month until she died this past December. We would also visit my mother’s oldest sister Lorraine, but not as frequently, since she lived several hours away. Reflecting on the faith-filled lives of these women, I recall three lessons they shared with me. Aunt Jean taught me about the importance of prayer. Even though she had a stroke in 2008 and was confined to a wheelchair, she was always praying the Rosary. I made her a rosary out of green twine, which was her favorite color. She told me that she was always praying for me. I know she is still praying for me, because she was buried holding the green twine rosary I had made for her. I try to imitate her example of constant prayer for others. My aunt Jean also taught me to enjoy my food. She had a bout with cancer that took away her sense of smell and taste many years ago, and because of her stroke, she wasn’t the neatest eater. But that didn’t stop us from bringing her a bag of candy—Hershey’s miniatures were her favorite—whenever we would visit. Aunt Jean’s eyes would twinkle, and she was delighted with the treats, even though she couldn’t taste them. At our last visit with her before she died, Aunt Jean enjoyed sharing one of the miniatures with us. For my aunt Jean, enjoying food was not about savoring the taste of things, but enjoying the company of those she shared her food with. A similar lesson was also taught by my aunt Lorraine. She moved to be near the family in her later years, and she lived in an assisted-living home for the last ten years of her life. Although the assisted-living community provided meals, she would call me up to take her to the grocery store for the sweet treats that her community didn’t provide. We both had a sweet tooth for pastries, and we loved sharing tips on which ones were the best. As walking became more difficult for my aunt, we would take a home-cooked meal to her once a month. She loved these meals, and we loved making and enjoying dinner in her apartment with her. 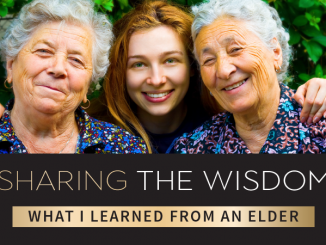 Their lessons are timeless and simple to implement: to pray for others, enjoy the company of the people we break bread with, and express gratitude for all things. I am so grateful for these strong, faith-filled women in my life and the wisdom they shared with me. What wisdom have your elders shared with you? Visit www.sharingwisdomoftime.com/sharing to upload your videos and photos. 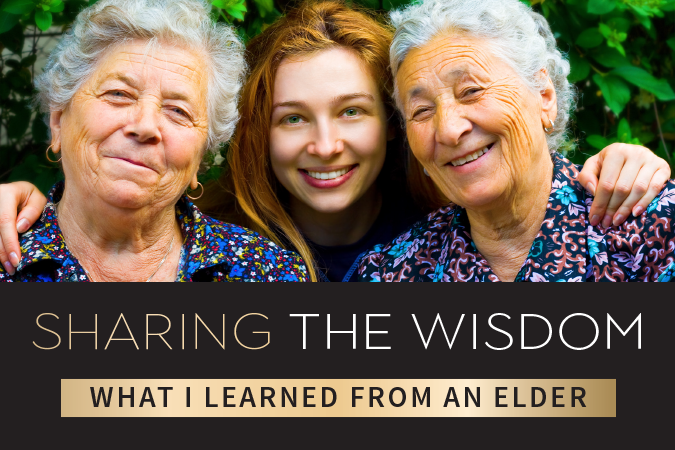 All this week here at Catechist’s Journey, we’ll be sharing stories of wisdom learned from our elders—but we’re not the only ones! Our friends at IgnatianSpirituality.com and BeckyEldredge.com will be sharing too. We’re all inspired by Sharing the Wisdom of Time by Pope Francis and Friends. Order your copy of Sharing the Wisdom of Time at 25% off by using the code 5043 at loyolapress.com. I really appreciate the simplicity of the articles. I also like sharing of the same, because our life is made up of small things, but they are not small if they are done with love and joy.